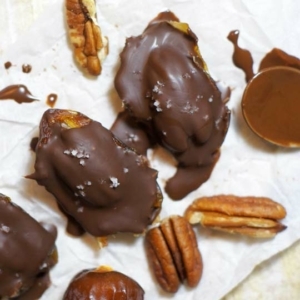 These chocolate turtles feature fresh dates as a naturally-sweet and chewy "caramel" filling, along with raw pecans and dark chocolate for a quick dessert that's lower in sugar. Melt the dark chocolate and coconut oil together in a double boiler over the stove and set aside. Press a pecan half into each of the eight date halves, then top with about a teaspoon of melted dark chocolate, to cover the top and sides. Sprinkle with coarse sea salt, then place in the freezer to set for 10 minutes, or until the chocolate coating is firm. Serve immediately, or store in the fridge until ready to serve. These should last about a week when stored in the fridge, if you don't eat them all before then! These are only vegan if you choose a brand of vegan chocolate chips. Be sure to read the ingredient list!